Written by award-winning children's author, Kathy Peach, and illustrated by Alex Lopez, The Tiniest Tumbleweed’s two delightful desert characters help children believe in themselves and their capabilities. and that is just fine, just fine indeed. Everyone feels small or inadequate at some point in their lives. The Tiniest Tumbleweed helps children learn more about what they can do to become their best selves, despite whatever may be making them feel small or limited. The characters are two Sonoran Desert neighbors, a tiny tumbleweed and a baby house sparrow. Achieving dreams is always possible—even big dreams, like becoming a first-time college graduate and starting two new careers at an age when most people think about slowing down. In 2009, Kathy Peach uprooted her life and moved from her home of 52 years in Middle Tennessee to Chandler, Arizona, with her husband, Bobby. CHANDLER, AZ (winter, 2016)—Everyone feels small or inadequate at some point in their lives. The Tiniest Tumbleweed, a children's book by first-time author Kathy Peach, is a story strategically constructed to help children think big thoughts about what they can do to become their best selves, in spite of their circumstances. 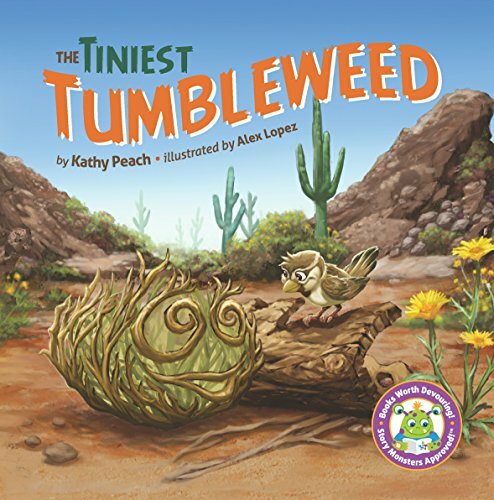 Written by award-winning author, Kathy Peach, and illustrated by Alex Lopez, The Tiniest Tumbleweed’s two delightful desert characters help children believe in themselves and their capabilities.